Boy, is this a thrill: the Chief Residents at the Mayo Clinic have invited me to be their Visiting Professor in Internal Medicine next March. A patient. As Visiting Professor. Is that a sign of the changing times?? The announcement is being made today, during the patient panel at Mayo’s sixth annual social media summit. Here’s their post, including a four minute video interview. Here’s their press release – their words – then I’ll discuss below. Every year, the Mayo Internal Medicine Chief Residents have the opportunity to invite a Visiting Professor to come spend several days engaging in educational activities and speaking at Medical Grand Rounds. Invitations are meant to reflect upon the personal interests of the chief residents and the messages we wish to convey to our Medical Grand Round audience – which consists of trainees, consultants, and researchers across the Mayo Clinic Health System. Over the last three years, previous chief residents have selected leaders in the fields of medical education (Dr. Jeffrey Wiese), quality and safety (Dr. Robert Wachter), and the CDC’s epidemic intelligence service (Dr. Douglas Hamilton). This year, we wanted our choice to represent a field with a similarly widespread impact on the future of medical practice, but also reflect our personalities with an “outside of the box” message. union of forces is necessary. Dr. Will Mayo was stating the importance of a diverse medical team coming together to attain a common goal – the foundation of our institution’s mission has been built around this belief. However, in our experience, we have found it as important to have a “union of forces” between providers and the patients who entrust us with their care. Patient engagement and empowerment is a natural extension of Dr. Will Mayo’s vision of a medicine as a cooperative science. We are therefore honored to announce Dave deBronkart (aka “e–Patient Dave”) as our 2015 Visiting Professor to help spread this powerful message. We look forward to his March, 2015 visit! Look: “A union of forces between providers and the patients who entrust us with their care.” This is the first formal recognition I’ve heard of, from any academic medical center, of this new imperative for physicians to join forces with patients as colleagues. Heaven knows it’s not a radical new thought. 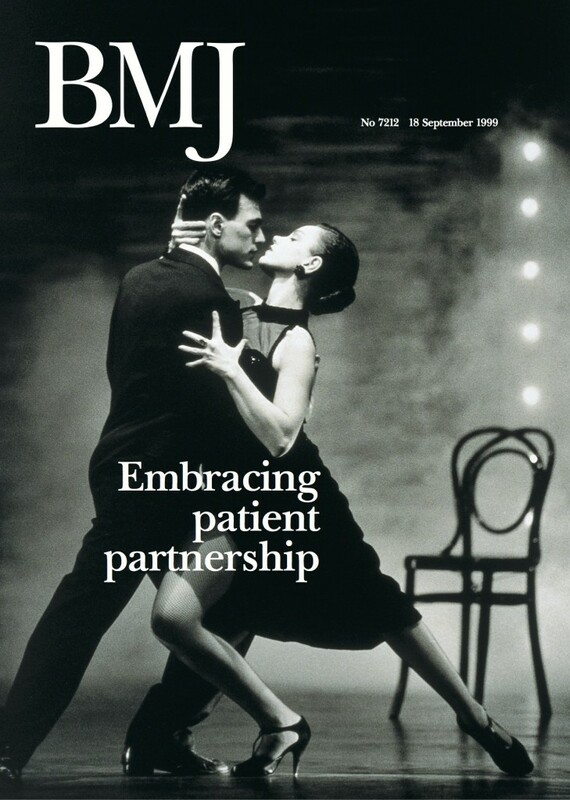 Fifteen years ago the cover of the British Medical Journal (one of the top journals in the world) showed a tango: “Embracing patient partnership.” But medicine doesn’t adopt new ideas on impulse – in some ways that’s a good thing – so it’s a big deal to now see that this idea has acceptance from a big name like Mayo. And thank you to the many, many patient voices whose work, whose competence and whose achievements have paved the way for this moment. The best note I’ve seen about this, so far, is from @Doctor_V on his famous “33 Charts” blog: Can a Patient Teach Medical School? We highly regard the idea of embracing a partnership between Doctors and patients in order to attain proper diagnosis and treatment. The Hypersomnia Foundation supports that collaboration. Terrific! Let’s build a list of people who have similar things going on! Congratulations Dave! And Kudos to Mayo for recognizing the importance of the Family in the care regimen of their patients. A great day for the PFCC movement. Congratulations Dave. This is a truly remarkable moment where your efforts have been recognised. I wonder if you can get your clinician to join you too – that’s the next step when we realise it takes two to tango! I just found (at least one) source for the “best interest of the patient” line: Mayo’s tradition and heritage page quotes him saying it at the graduation of Rush Medical College, in 1910. This evokes thoughts of IBM’s head of worldwide healthcare, Paul Grundy MD, who says specialists are “partialists” – they only treat part of the problem, never taking responsibility for the whole patient’s well-being. Hm. So excited to hear you are coming to Jacksonville. I too am a renal cell carcinoma survivor Stage 4 since 2011. First diagnosed in 2005 Stage 2. Getting ready for clinical trial at Mayo clinic which I had researched and asked to participate in by the way! I have followed your journey as we have a similar one as I have rufused to accept the given prognosis doing everything you have said to help the doctors help me.In addition I am co-chair of patient support with the Judy Nicholson Foundation for kidney cancer research in Jacksonville, Fl. which has several Mayo Physicians on their Board. I would love to further discuss information that I could share with our patient support group. I would also like to invite you to visit the JNF website and attend and/or sponsor and or/ pass the word about our upcomming Battle of the Bands event March 28th in Jacksonville the Saturday after you will be in town. Thanks for all you do and thank you for the uplifting inspiration! Congratulation to you Dave and to the faculty inviting you.